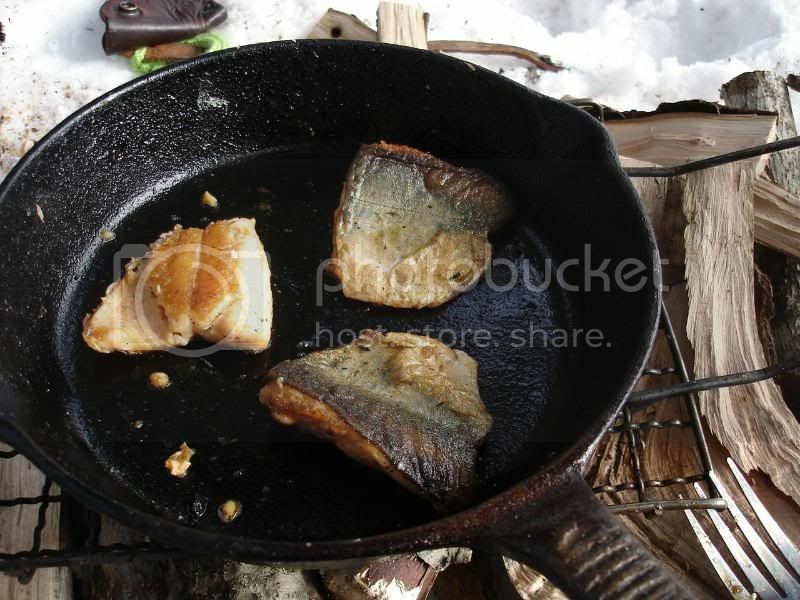 a few pics from last winters spec trip. steep/narrow areas-5 trips to get my gear over the one hill. breezy conditions on the way back to vehicle. of this warmer winter weve been experiencing? possibly sticking to smaller lakes and or travelling further north? areas i have visited in past has shown non stellar conditions. inspired by others who have added a vinyl door. recently completed a vinyl door mod for me. the man has some serious skills.! lakers def makes for a tasty lakeside treat. recently i read that a spec fisherman is one part dreamer and one part unwilling realist. i think thats pretty accurate. was fortunate to ice two over seven days. hour after hour i always convince myself that thell be biting soon. Just back from a 9 day 60 km solo trek. After fishing for specs and lakers these last fw yrs i was naturally drawn to the boreal forest to try my luck to ice some pike and pickerel. Id visited this general area last year but was blown away by a huge weather system. I was actually buried in the snow on my way in by a mining plow truck . no worries tho, they ended up loading my gear and taking me up the snow choked rd for my troubles. (which was exceedingly nice i thought) On day 4 tho a big weather system roared in dumping 40+cm of snow with wind gusts of 80-100km. I had a hard time with the inexpensive CT sled i had and vowed id build a uhwmp sled and return the following yr. The road id set out upon this yr was not being maintained at all, which would mean it would be 15kms of trekking to the first lake and then an additional 16kms of travel to the nxt fw lakes. On my first day i met up with some locals who have a camp and was received warmly, (albeit incredibly perplexed by me.) These are all snowmobilers. 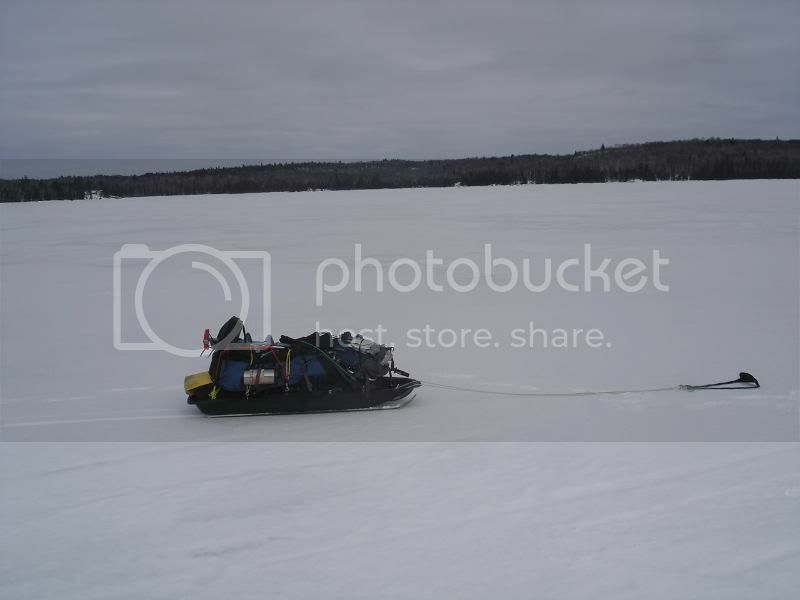 No one hauls a toboggan . They all looked like they saw a ghost when i showed up. I was treated to northern hospitality like no other. 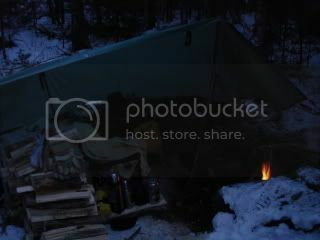 They were all heading out and offered the use of their camp, complete with hot stoves.! Ive gotta say, this was luxurious living. Ive never experienced 40 degrees above zero. I was quickly desensitized to my sense of ‘cold comfort’. Suddenly 10 degrees was cold and i was eagerly looking to feed the stove. Soon i was back on the trail covering the nxt portion of lakes/portages. Was amazed at how much snow the lakes had (2ft) I naively thought they'd be wind swept. 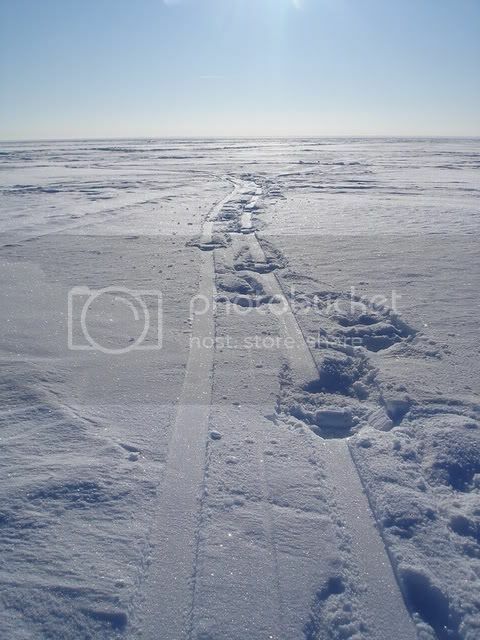 Beneath the deep insulating layer was a deep layer of slush. 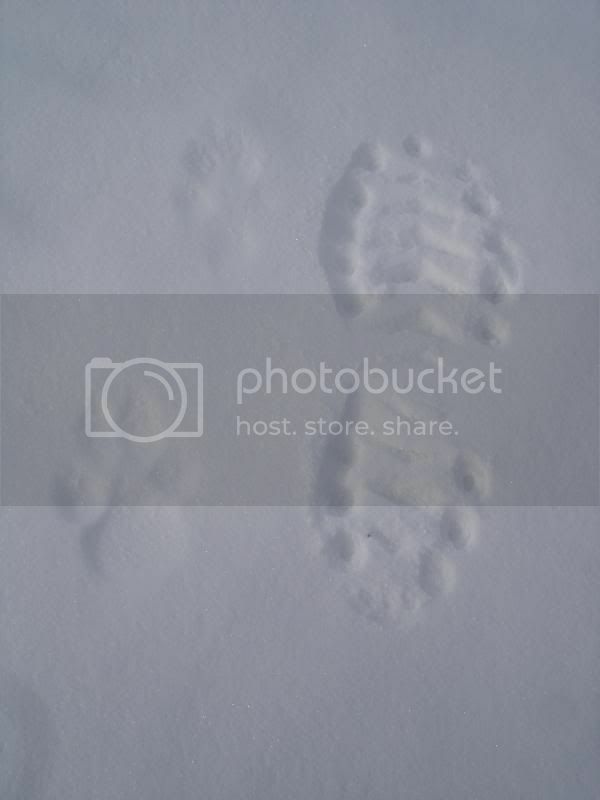 The 16X48 traditional snowshoes worked quite well. 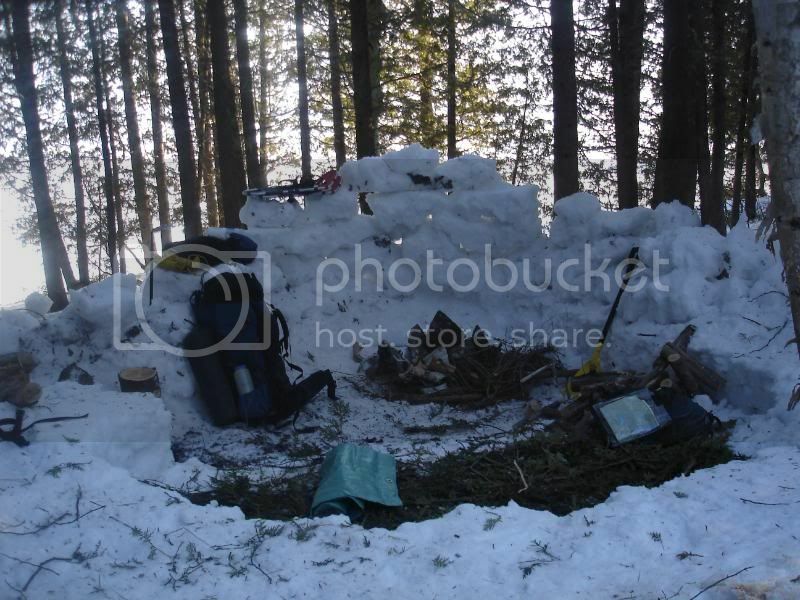 Now usually cold camping is a much lighter/faster way to travel but i take a chain saw, gas, oil, tools, tarp, tent, splitting axe, thermoses and camp chair. Fully loaded i was about 170-175lbs. I highly recommend if anyone chooses to take a chainsaw to take a course and get experience. Any mistake with this piece of equipment out there would spell disaster. On many occasions ive thought of retiring the saw and switching over to the hot tenting. That way id be able to get away with a small hand saw for harvesting and of course enjoy some easy luxurious living. I think nxt season ill make the jump. Ill have to consult the engineering expertise of my friend Zelandonni to build one. Temps for the first few days were mild but changed toward the end of the trip with 3 nights of –30/-35. Was the first time id broken camp with a full bore fire. Took me 3.5 hours to break camp.Fishing was ok, a bit on the slow side but still managed 7 fish. 3 Pike and 4 Pickerel. All in all a fantastic trip! Was so incredibly fortunate to have met my new northern friends. I have been so blessed over the years in meeting many kind and generous people like no other. power tool and par of the repair kit. this is one of the smallest stihl saws. its a home owner unit that has been well cared for. snausages,bagels and extra old cheddar. yum! theres a tree in there somewhere. Finally got out for my first winter solo trip of the year. Went back to ne Ontario and was fortunate to meet up with and old friend. Saved me the 5.5 kms of portage travel that last yr took me two hours. Spent most of my time on the one lake with a few day trips to neighboring lakes. Made one longish excursion (13 k) into a favorite lake of mine. Weather was decent averaging around -15 for overnight lows. A good mix of sun and clouds with not much precip during the days. Once again I was so fortunate to be able to go cold camping into a favorite area of mine. 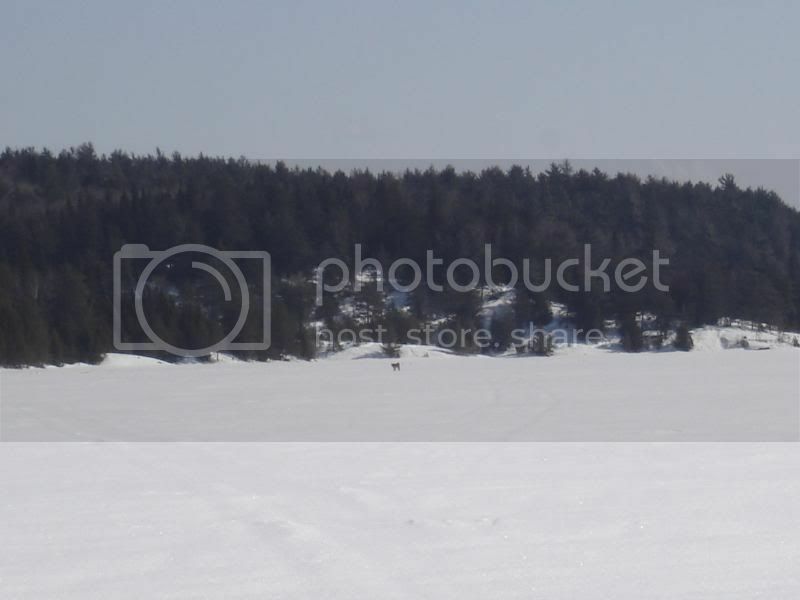 Located NW of Sudbury Ontario, this is classic Canadian Shield country. 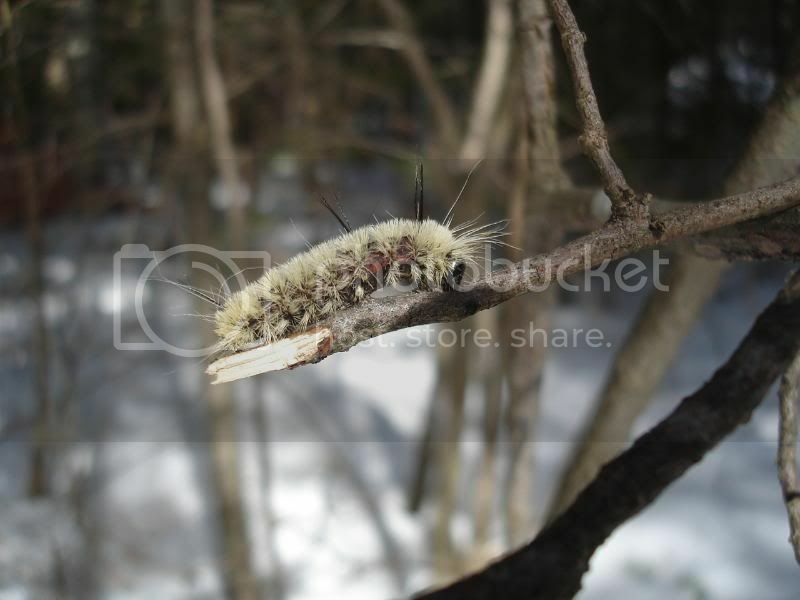 Its in a transition zone where youll find both conifers and deciduous trees. (always a treat with regard to firewood). I spent 5 days cold camping and 5 days base tripping out of hotels. With 4000 lakes nearby one doesn’t have to travel too far from town. Weather was quite agreeable. Coldest nitetime temp was -20 with nitetime averages being -12/-15. Day one saw me hike the 10 kms over two lakes and portages to a known lake trout lake. Here I stayed for 4 nites. The remainder of my time was spent looking for specs on other lakes. 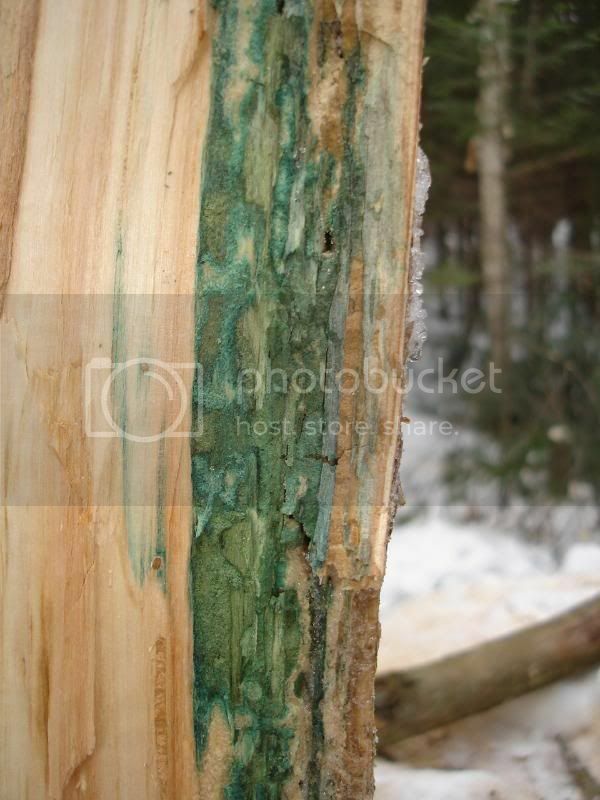 While chopping firewood I noticed an unusual turquoise colour on this large piece of maple. Iam guessing some sort of fungus? With camp established and firewood cut, its time to bask in the warmth of the fire. A nice chunky laker. Real sustenance.! Nows its off to a few spec lakes within the surrounding hills. Heading into a secluded lake 2km off the road. One of the nice things about day tripping is you can travel extremely light which makes for very fast travel. Arriving at the lake it’s the first time ive had to use the snowshoes… and happily so! This year there hasn’t been much snow in the area. Nows it off to another lake that iam hoping will produce the elusive Speckled Trout. They can be a very finicky bunch at times. Fortunately ive been here before and have come to know a few of their haunts. 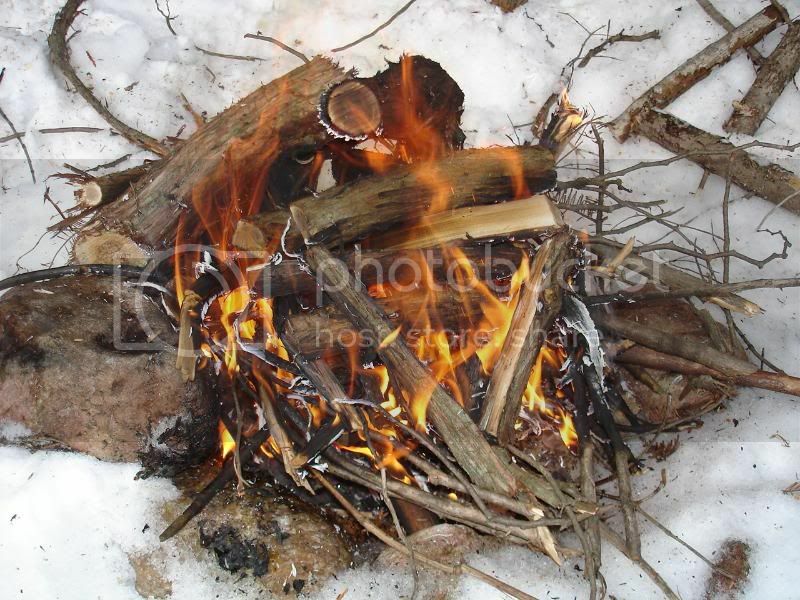 Time for lunch, I quickly find some birch bark, cedar and balsam fir to start the fire. Then I see if I can spot some hardwoods to provide the perfect coals. 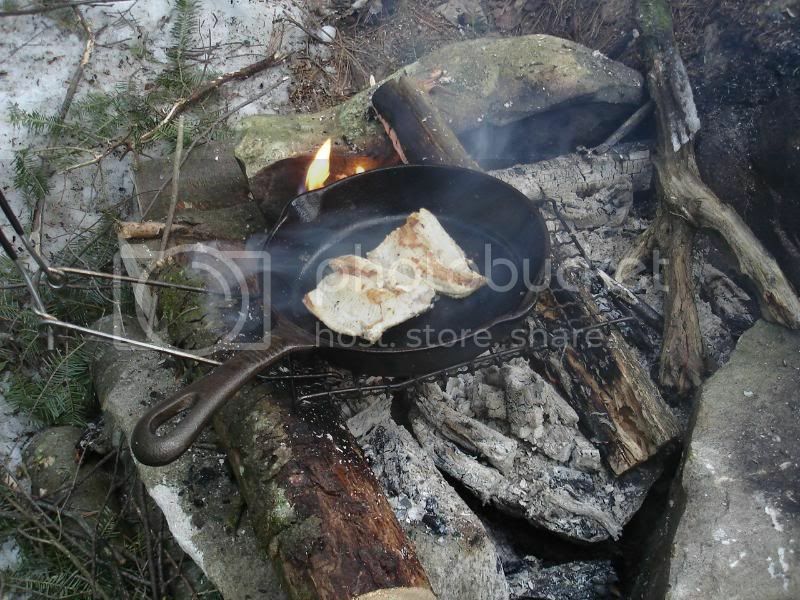 Nothing like fresh specs cooked over a hardwood fire.! These are from a short trip id taken back in mid March. Coolest night was -26 and the warmest day time high was a beautiful sunny +5. I was very fortunate to have seen a Lynx (a first for me) albeit from about 700 m away . Fishin was extremely slow. Biggest catch was some ones fishing lure. i am thinking yet again of getting some ice cleats. Ive seen many different brands out there but was hoping to get some first had experience from those that have used them. Heres a pic of my first whitie of the hard water season. Its only taken …. 4 years. Gold and silver Moose Looks spoon tipped with emerald shiners. Had I known it was going to be as cold as it was I probably would have rescheduled. Was my first winter trip leaning in towards -40. Fortunately I brought a heavy weight wool blanket to line my old down sleeping bag with. The bag was rated for -26 ten years ago but just isn’t what it used to be. It was my first trip using a gore bivi which made a HUGE improvement with keeping my sleeping system good and dry. (thanks to the good info found on the site) Without one my bag would be done by day two. 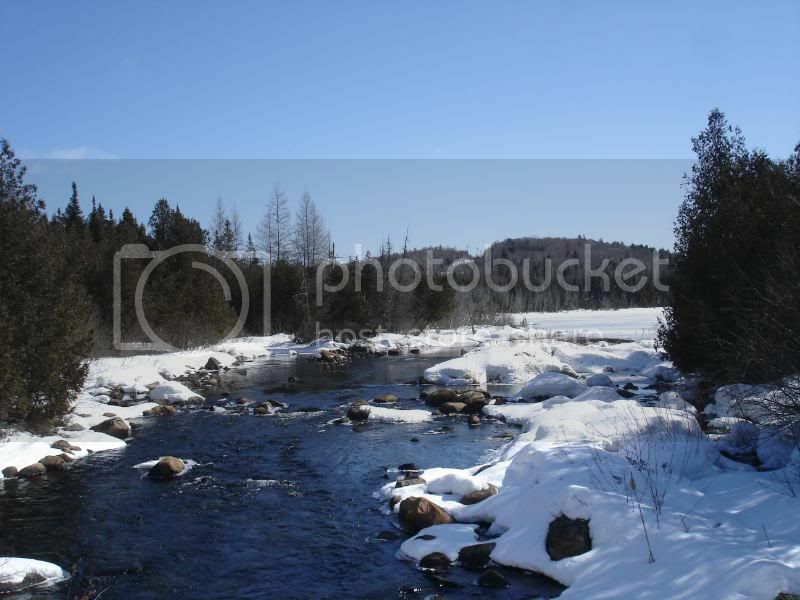 The area I went to was northwest of Sudbury and is a known trout stronghold. I only managed to ice a spec and laker the whole trip. It was far too cold for taking pictures that day. (both quickly released.) Ironically the spec was too big and the laker too small to eat. Go figure. 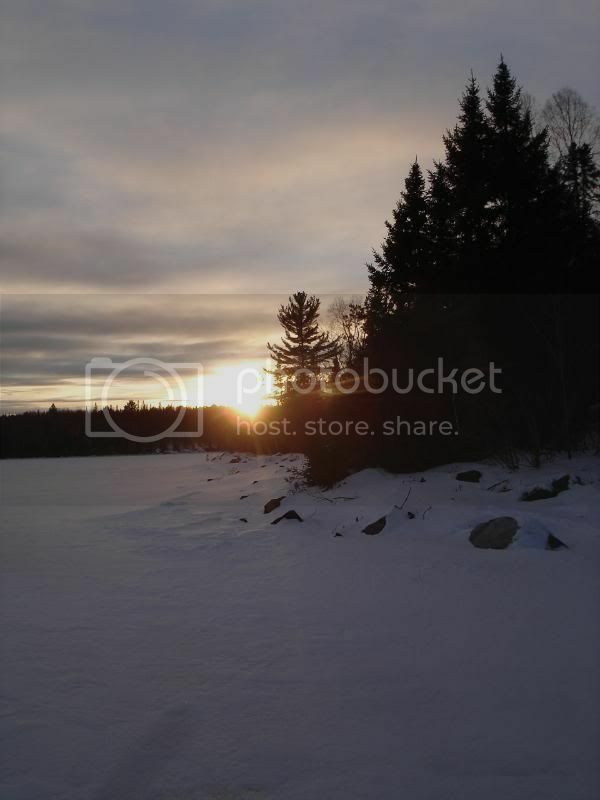 Another first was using a new set of Algonquin style traditional snowshoes. Was incredible how much more flotation they have compared to the modern ones . Took HOOPS good advice and went with the largest size. Winds often change direction which affects smoke/heat levels under tarps as you all know. By constantly altering the pitch to accommodate varying winds I would notice differences in heat/smoke levels. Sometimes id find the fire struggling a bit, so id move a pole to allow more air in and it would pick up. Shovels, telescopic ski poles and sticks all work well for this. 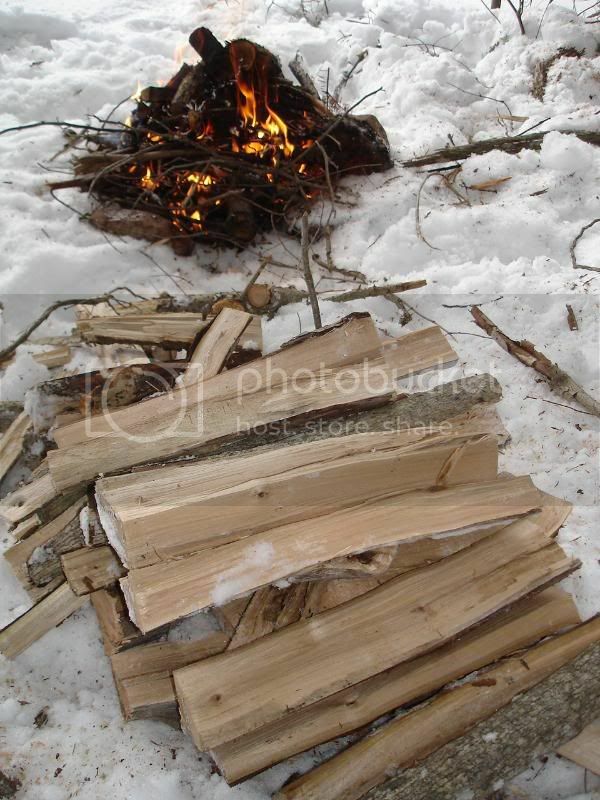 Without a rock to radiate heat I used the log heat reflectors and they worked very well. A little bit of brass wire and I had a sweet reflector. I am still using the old Canadian Tire sled which I modified with a pair of cheap down hill skis. I wish CT still made these sleds, would be great to make mine a little longer. The extreme cold temps made for awesome snow conditions for sled hauling. The wax id put on the skis made for a very fast sled. 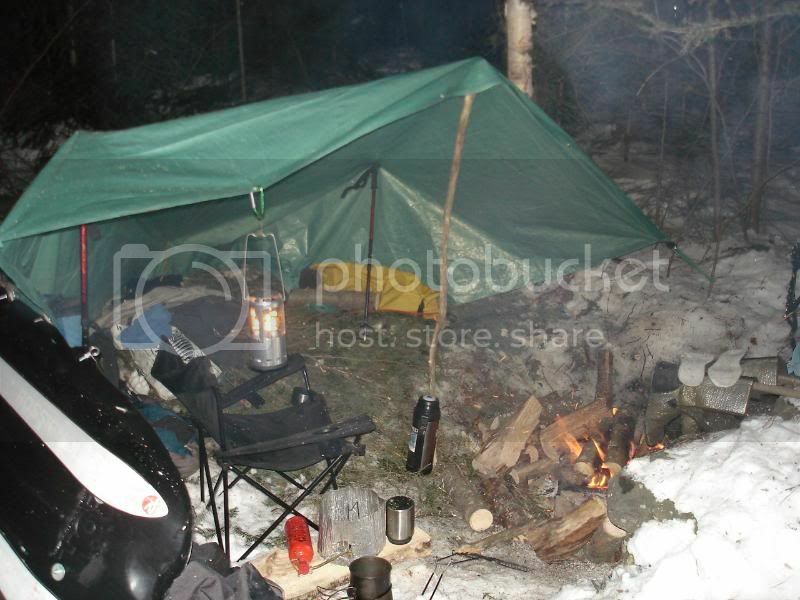 Btw, what do cold camping folks do with their boots in the evenings? 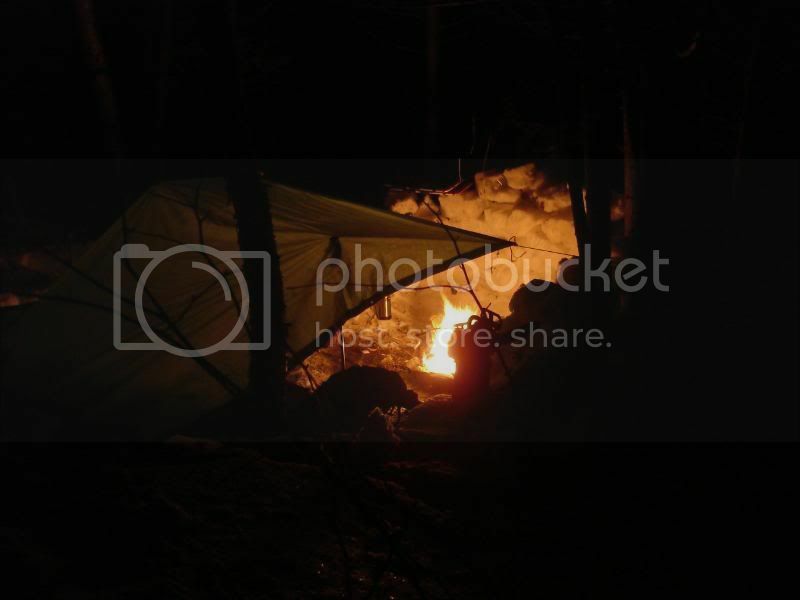 Do you take your liners out and put them in your sleeping bags? Found myself having to do laps to get the warmth going each morning. I sure am envious of the hot-tenters. Does anyone have advice on how best to prepare ones vehicle to be left for extended periods in cold temps? Other than using 5W 30 oil, gas line antifreeze, keeping your battery in peak shape and possibly using a solar powered trickle charger? Any other tips?